MPC’s Destructible Vinyl Asset Labels will fracture and break apart if detached from its mating surface, discouraging tampering and protecting against unauthorized transfer or property. These labels consist of a 2.0 mil white cast vinyl face stock with a 0.8 mil permanent pressure-sensitive adhesive that bonds to high- and low-surface energy plastics, textured and contoured surfaces. 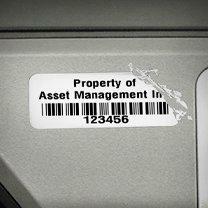 Why choose MPC’s Destructible Vinyl Asset Labels? Designed to self-destruct with removal. High contrast for easy readability with black graphics on white background. 2.0 mil white cast vinyl face stock. Black graphics on white background only. Four standard sizes: 1.50" x .50" - 1.50" x .75" - 2.00" x .75" - 2.00" x 1.00". Custom sizes available.